My opinion is that you should use a tracker. You can do what you say, and maybe it will be fine. But if someone questions your result it won't be as defensible as a tracker. Anything that's saved on your phone or on your wrist and uploaded later is easier to fake (easy to fake). Thanks for all the work you do with this site, Peter. I did have real trouble with the battery life on my Spot on the Long Trail--I don't think the Spot likes trees--but I do think your new rule is the best way to go. FYI I just tried to donate using the link on page 1 of this thread, but after I click on the dollar amount and then "continue," I get a page not found/404 error message. Thanks for your willingness to contribute! I don't know what to say about that error message - this is a proboards thing. I just tried and got the same message. Rats. Yes, SPOT seems to have troubles with vegetation cover. On a trail like the AT I'd probably go with DeLorme. I use the SPOT quite a bit out west (CO, UT, AZ) where we don't have a lot of trees and it seems to work usually quite well. In general it seems like DeLorme is the better, more reliable system, but SPOT is cheaper. A solo hiker may not want to post their tracker link publicly for safety reasons. You should at least give the link to 1 or 2 objective, reliable people who can watch the track and vouch for what they see there. Also, you should be sure to download the track points before they get deleted from the host server. I think SPOT saves points for about a week, but I don't know about DeLorme. That means on a longer trip you'll need someone with access to your SPOT account who can download the points for you. On Sept. 20-23 I was in Olympic Nat. Park and tested a SPOT "Trace" unit (the cheaper kind that was used at Hardrock this year). In the heavy rainforest tree cover there, it didn't do too bad. It was set for 10 min interval, and while there were some gaps as long as 45 min, it would have been adequate for proving a run, I think. However, I agree that DeLorme is more reliable after watching Meghan Hicks' (SPOT) and Nick Pedatella's (DeLorme) near-simultaneous Nolan's tracks, when the two tracker units would be seeing the same satellite configuration (an important variable). The DeLorme track was much more consistent, but again the SPOT track seemed good enough. On SPOT saving points, yes the Olympics points are gone on my publicly-shared page, but I still have full access (viewing, download) to all the points almost a month later at my login page (login.findmespot.com). The interface is terrible -- I can only view/download 25 points at a time -- but they ARE still there. So if you gave someone your login after the fact, they could verify your run. Good info & clarification Jeff! Also, for some routes (Nolans!) using trackleaders would be good. They save the points forever for everyone to see. After reading Jeremy Platson's post on the Superior Hiking Trail thread, I checked back and can confirm that SPOT only saves your points under your private login for 30 days. From browsing around on Mahoney's Nolan's 14 site, it looks like DeLorme keeps your points up on the public page for around 2 years. "Thank you for contacting SPOT Customer Care. As an alternative, you are able to download the tracking information to your computer. While you are away have someone log into the account once every 30 days to download all of the track data so you may be able to review it once you get back. We can also send you a report of your tracking information if you provide us with a start and end date." So sounds like you could get your SPOT proof back with a special request. Maybe Jeremy Platson could try this for his proof of his Superior Hiking Trail FKT, which was recently requested. Thanks for the info Jeff. I contacted Spot and they sent me all my missing data for my hike. Hey so I have to Spot Gen 2. Planning on going for the Appalachian Trail Self Support this year. The Gen 2 tracks every 10 minutes wasting tons and tons of battery. Usually I drop a cord up one a night. How's the feelings on that? I don't understand the meaning of "drop a cord up one a night". ? If you don't want to use tracking mode at least activate the unit a few times per day. Choose your locations intelligently, i.e., places far from roads where it's clear that you had to walk. Peter, amazing site. Thank you very much for all your hard work here. 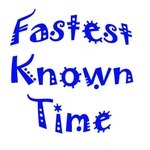 Have you considered age/gender groups for fastest known times? I am planning a self supportive (west bound) Colorado Trail this year (2017). This year I turn 60 years old in June. No way can I do approximately 50 miles a day anymore to break the current record. I think I can come pretty darn close to the current record by a day or three. I have the Delorme system. I am planning one or two caches along the trail. Recommend a men and women's Master's division for 45 to 59 and a men and women's Master's Plus division for anyone over 60. I don't how many hours this would be logistically to set up and keep records. It'd be kind of fun though. Thoughts please? Age groups are a nice idea, but I won't do it. It's hard enough just verifying what people did. Plus, there are just too many permutations (route x style x age x gender). I turn 55 next month, so I feel your pain. All that said, there's nothing to stop you from doing your trip & then posting here your fast (though not fastest) time with a note of your age. Many people will be inspired, I think. Regarding the use of a SPOT tracker, I found in the past that SPOT satellite communication was poor and unreliable in the dense vegetation of the Great Smoky Mountains. I'm contemplating an FKT attempt in this area. Any advice on dealing with this issue? Any one know if they latest generation of this device resolved this issue? I know the SPOT is quite handy out West, but I had to get rid of mine because 90% of my activity is in the mountains back east. I don't have these issues with Suunto and Garmin GPS devices. Looking at the guidelines around using Spot or similar for verification. I don't really want to invest hundreds of $$ for something I may only use a couple of times. If we record our attempt using the app Motion X GPS (may not have existed when this guideline was written). It is possible to provide live updates and tweets during the journey as well as provide an and to end recording at the end. Will this be sufficient? It seems like it effectively does the same thing as Spot, but using an iPhone. If it does real-time updates on the web, and if those are available to reliable and objective third parties, then that should be sufficient. Obviously, it will only work if you have cell coverage, unlike Spot/Delorme, which work everywhere.